Odds are high that you reuse the same garden beds and containers season after season. Over time, the nutrients in those areas get used up. You can replenish your Morgan Hill soil by incorporating aged compost, blood meal, cottonseed meal, or commercially prepared fertilizers. These materials are normally applied as a top dressing, and allowed to work their way into the soil naturally. Banding takes this idea one step farther. 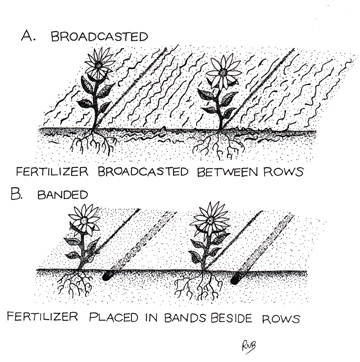 Banding refers to the practice of creating a band of fertilizer that runs alongside and a little below your rows of seeds. Banding your seeds with these “starter fertilizers” makes valuable nutrients available to early roots, helping seedlings to grow faster and bigger. This gives them an advantage over weeds. Also, placing nutrients within easy reach means less is wasted. Before jumping on the fertilizer bandwagon (sorry, I couldn't resist), you need to learn what is in your soil. You can't know what to add if you don't know what is missing. Most Morgan Hill soil already has an abundance of phosphorus, but yours might not. Adding more could be detrimental to your plants, and it's a waste of money. Adding any unnecessary fertilizer also puts the environment at risk. Before adding fertilizer to your soil, find a reputable, local soil test company and submit samples for testing. The results are fascinating and useful. (Over-the-counter soil test kits are not useful yet.) If your soil already has plenty of everything, banding is unnecessary. If your soil is lacking any of the big three plant nutrients, banding can help your seeds overcome this handicap. All fertilizers are required to provide information about the percentage by weight of nitrogen (N), phosphorous (P) and potassium (K). This means that a 10-pound bag of 10-20-10 fertilizer contains 1 pound nitrogen, 2 pounds phosphorous, 1 pound potassium, and 7 pounds of filler. After you have gotten the results from your soil test, you can select the best fertilizer for your crop. After removing summer's bounty and preparing your garden for cool season crops, make two rows for each row of seed, instead of one. One row is for the seeds and should be the recommended depth, depending on the type of plant. The row next to it should be two inches deeper and two inches to the side. Lightly apply fertilizer to the deeper row and plant your cool season crops in the shallower row. Cover both rows with soil and add a little water. Before you know it, your cool weather crops will be thriving, all thanks to good information and a little banding. You can learn more about winter gardening at the South County Teaching and Demo Garden, found at St. Louise Hospital, 9400 No Name Uno, in Gilroy. Free classes are regularly offered to the public. For more information, check our events page or call 408-282-3105 between 9:30 a.m. and 12:30 p.m., Monday through Friday. This article first appeared in the November 8 – 21, 2017 issue of Morgan Hill Life. Late summer plantings should have a solid start by October. Caring for these plants during the autumn and winter months can extend harvests and protect the soil. 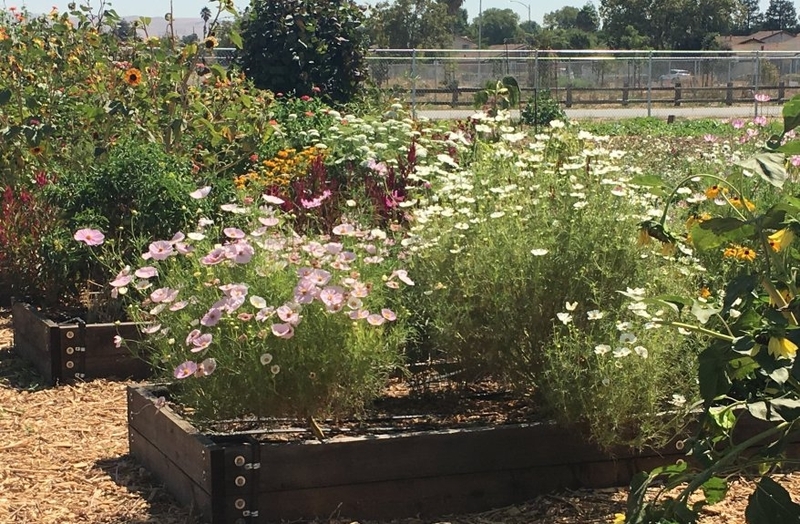 Assuming that the Morgan Hill area gets its much needed rain this winter, growing flowers and vegetables during the winter months can provide a delicious harvest, while reducing erosion and promoting soil health. So what can you do to care for your winter crops? Whether you plan for your garden to work or rest this winter, adding organic soil amendments now can replenish nitrogen levels and improve soil structure. Popular soil amendments include alfalfa pellets, blood meal, and fish emulsion. Aged manure or compost can also be dug in, or used as a top or side dressing to feed winter crops right away, or spring crops later in the season. The benefits of mulching cannot be overstated. 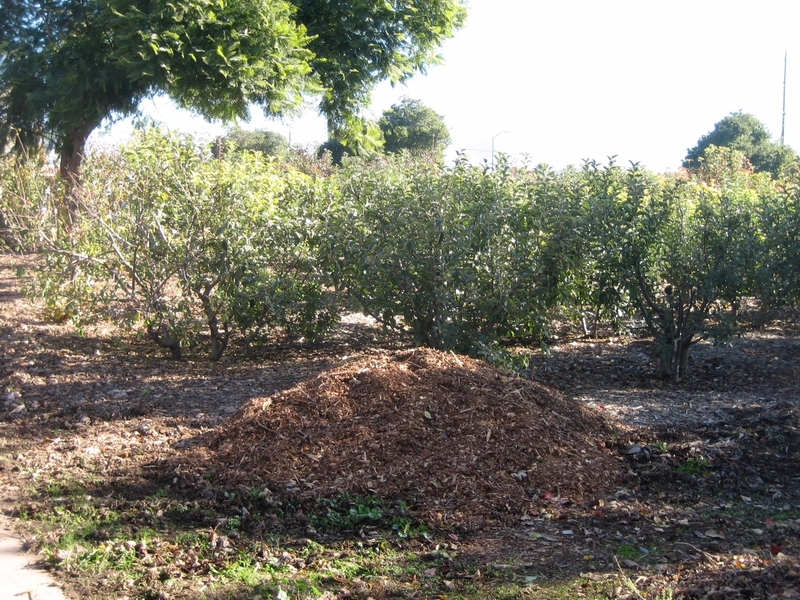 Covering the ground with two to six inches of mulch is one of the best ways to protect your Morgan Hill crops and soil. Mulching prevents runoff and erosion. It stabilizes soil temperatures and makes it more difficult for weeds to get started. You can often get free wood mulch from local tree trimmers. Just be sure to keep mulch a few inches away from tree trunks and plant stems. Continuous exposure to moisture can lead to fungal diseases. Some summer annuals may be hanging on, but they are not going to benefit anyone except local pests. Dead and dying summer plants can play host to many different pests and diseases. Toss diseased plant material in the trash and compost everything else. This is also a good time to prune fruit and nut trees. Cut out any dead, diseased, or crossed limbs. Do not prune apricot trees or grape vines in the rainy season, or you may create an entry point for Eutypa dieback, a fungal disease that can kill a tree or vine. While colder temperatures slow the growth of most plants, there are still several cool season crops you can start in October. These crops include artichoke, arugula, asparagus, beets, bok choy, Napa cabbage, chard, cilantro, collards, dill, fennel, garlic, kale, kohlrabi, lettuce, mustard greens, peas, radishes, spinach, and turnips. Late summer plantings of broccoli, cauliflower, fava beans, leeks, Brussels sprouts, and cabbage should be well on their way by now. Adding side dressings and mulch can provide nutrients and protection to these cool weather crops. This article first appeared in the October 25 – November 7 issue of Morgan Hill Life. Even if you are not planting cool-season veggies, herbs or flowering plants this fall, you should plant a cover crop in your garden and/or raised beds to enrich the soil for next season. Gardening in the cool season is easy and low-maintenance yet very productive. There are hundreds of varieties of vegetables, herbs, flowers, and ornamentals that help sustain the birds, bees, and beneficial insects in our local habitat, as well as providing delicious food for you and your family. Even if you are not planning to plant many veggies and herbs this fall, you should definitely invest the time to plant a cover crop in both your garden and raised beds. Cover crops take very little effort. You plant them once, water initially to get them started, and then let Mother Nature take over — assuming we are blessed with another wet winter. Here in the Bay Area, the primary need is to add nitrogen to our heavy clay soil in order to loosen it up and feed our plants. Excellent nitrogen-fixing crops include vetch, cowpeas, fava beans, and crimson clover. Buckwheat is a great choice if you want a quick fix. It germinates in about five days and is ready to be turned under in about a month. You can feed your soil now, and still get a great fall garden planted. For information and cool-season crops, don't miss the upcoming Fall Garden Market at Martial Cottle Park's Harvest Festival Oct. 7. The festival celebrates the agricultural heritage of Santa Clara Valley. There will be food, entertainment, activities for the kids, park tours, and more. 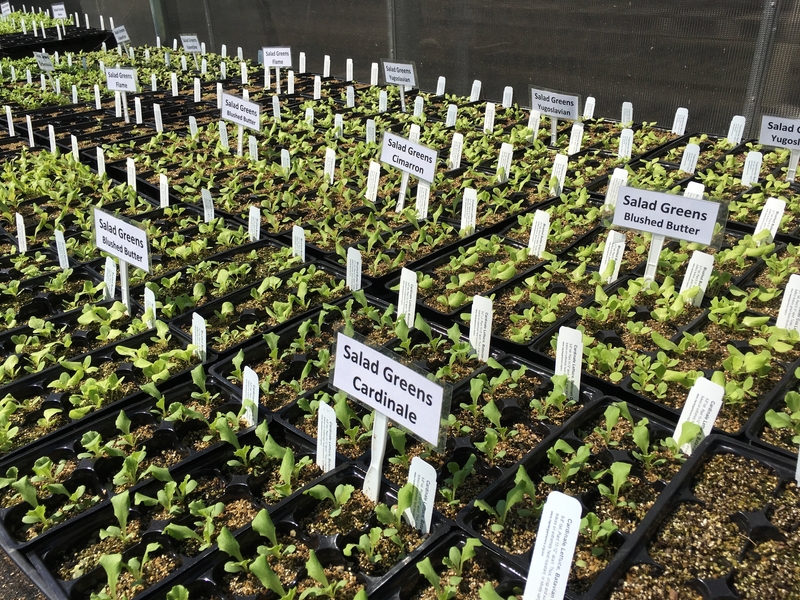 You will find seedlings of many Asian and Italian greens such as Chinese broccoli, pak choi, tatsoi, chicory, escarole, and radicchio. There will be dozens of varieties of beets, cabbage, and cauliflower. Try growing a few leafy greens that are great in soups, stews, and stir-fry meals, such as chard, kale, and mustard. They are cut-and-come-again plants that will keep on giving through next spring. And, if like me, you can't live without a fresh salad, you will find a variable salad bar of lettuce, spinach, arugula, cress, and mache to grow; all you'll need for serving them is a little vinaigrette! And yes, there will be peas, turnips, onions, and even kohlrabi, collards, and artichokes. Don't miss out on the blooming beauties: Agrostemma, Clarkia, Delphinium, Larkspur, Linaria, Snapdragons, Sweet Peas. Flowers not only add beauty, but bring in the bees and beneficial insects necessary for pollination and fending off the “bad bugs” that can damage your garden. Whether you are a seasoned-gardener or just starting out, you can pick up lots of tips from the festival's free educational talks — Amazing Succulents, Cool Season Vegetables, Glorious Garlic, and Native Plants. Growing your own food, whether with your family or by yourself, is not only enjoyable but truly important! You will conserve water, waste less (no one wants to throw away what they have worked to grow), avoid using harmful chemicals, nurture your soil, and help support and feed our native birds, bees, and other insects. And most importantly, you will make a huge, positive impact on your children; kids actually will eat what they grow! So head on out to one of our upcoming Fall Markets, and dig in! There are three upcoming Santa Clara County Master Gardeners Fall markets The main event will be at San Jose's Martial Cottle Park (5283 Snell Ave.) on Oct. 7, 10 a.m.-3 p.m. Admission is free, but there is a $6 parking fee. Other Master Gardener Fall Garden Markets will be presented Sept. 23, 10 a.m.-noon, Palo Alto Demo Garden, 851 Center Dr., Palo Alto; and Oct. 14, 10 a.m.-1 p.m., Guglielmo Winery, 1480 E. Main Ave., Morgan Hill. This article first appeared in the September 17 issue of the San Jose Mercury News. Harvesting may be in full swing, but fall will be here before you know it. This makes August the best time to start planning your autumn Morgan Hill garden. Each individual region has its own characteristics and Morgan Hill is no exception. While other parts of the country use autumn to prepare for harsh winters, putting up storm windows, we have the luxury of yet another growing season. 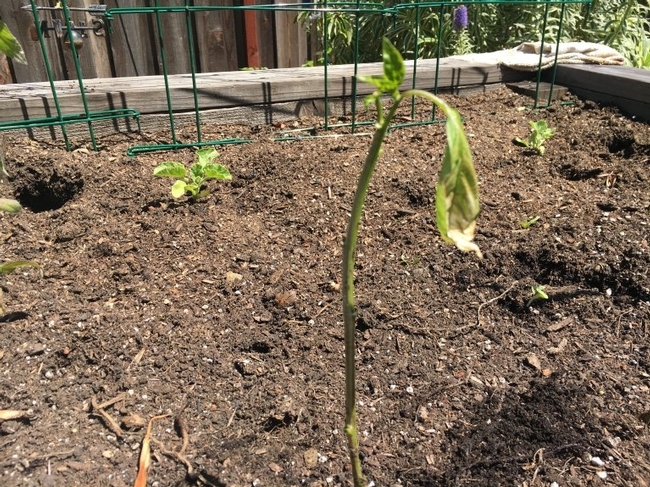 Your tomatoes, cucumbers, peppers, summer squash and melons are probably in full swing in August, but many heat sensitive plants have long since bolted and gone to seed. If you leave some of these plants in place, not only will they provide seeds for a future crop, but they will also provide nectar and pollen for many beneficial insects. The insects feed on or parasitize common garden pests, such as aphids, hornworms, cutworms, and many more. With the help of these beneficial insects, you can reduce or avoid using chemical pesticides altogether. Even if you do not actively collect seeds from the previous season's crop, you will probably discover next spring that you have many edibles throughout your landscape. To get a jump-start on your autumn planting, this is a good time to start seeds for artichoke, broccoli, cauliflower, chard, cilantro, collards, fava beans, fennel, kale, kohlrabi, leeks, lettuce and spinach, peas, and turnips. You can also direct seed arugula and beets in August, and this is the time to install Brussels sprouts and cabbage plants. Napa cabbage can be started now, as seeds or transplants. With scorching hot days ahead, be sure to keep those seedlings watered and protected as they grow. They may need to be kept in a protected area, without too much direct sun. As summer harvests reach their peak, you can help your plants stay healthy by removing dead and diseased plant materials. In many cases, the more frequently you harvest, the more food a plant will produce. To feed and protect the current crop while preparing for your autumn garden, be sure to add aged compost and other mulch material to your growing beds. This will add organic matter for improved soil structure, and it will stabilize temperatures, and feed the worms and microorganisms that help your garden plants thrive. That way, as September rolls around, your garden beds will be prepared for carrots and all the seedlings you start now. Staying one step ahead of the gardening game can make your landscape more productive. You can learn more about garden design at the South County Teaching and Demo Garden, found at St. Louise Hospital, 9400 No Name Uno, in Gilroy. Classes are regularly offered to the public. For more information, check our events page or call (408) 282-3105 between 9:30 a.m. and 12:30 p.m., Monday through Friday. This article first appeared in the August 30 – September 12, 2017 issue of Morgan Hill Life. A pepper seedling, planted too early, gives a good impersonation of a Charlie Brown Christmas tree. Peppers need warm air and ground temperatures to thrive. The weather is getting warmer and there's little chance of a sudden overnight freeze, but that doesn't mean it's time to plant your entire summer garden. There are consequences to getting ahead of the season. Like many of you, I bought my tomatoes and peppers at one of the Master Gardener's spring market sale. It was so cold and rainy that I wasn't overly enthusiastic to get out and work in the garden so I grouped my plants together, sat them next to the garden shed for a little warmth and protection and decided to let them be. Then, ignoring what experience has taught me, I decided to put them in the ground. And I paid a price for my impatience. Planting too early in cooler temperatures can cause stunted growth, wilting, surface pitting, foliage necrosis and increased susceptibility to disease. Low soil temperatures can stunt plant growth and prevent root development. Most summer vegetables like soil temperatures of between 55 and 65 degrees. Because my plants had just come from a greenhouse, where they were pampered with lots of light, water and warmth, they really needed to be hardened off before planting. Hardening off means to keep your seedlings in protected area, such as a porch or garage, and gradually acclimate them to their new environment, placing them outdoors in a shady spot for a couple of hours and slowly increasing the time. Plants that aren't properly hardened off are much more susceptible to sun and windburn as well as breakage. We also recommend planting your seedlings into larger containers as soon as you bring them home. So what happened when I didn't follow the prudent planting process? Well, one of my tomatoes snapped in half and I have a couple of peppers that look very much like the sad little tree in “A Charlie Brown Christmas.” I'll be starting over with some new seedlings and a bit more patience. And remember, peppers and tomatoes need 6 to 8 hours of sun. They also like well-draining soil and a pH of 6.5-7.0. Mulch around plants to help retain moisture and cut down on weeds. To avoid fungal issues such as fusarium and verticillium wilt, don't plant in the same area for 3 years, if possible. To avoid blossom end rot, make sure to provide consistent and deep watering. One of the most common tomato ailments is tobacco mosaic virus so don't smoke in or near your garden. Look for plants that are labeled disease resistant. The rains are tapering off, so make sure to keep young plants well watered. Peppers like to be kept evenly moist, but once tomatoes and peppers start fruiting you can significantly cut back on their water. This article first appeared in the April 30 issue of the San Jose Mercury News.